The Chicago Bears had an unexpectedly incredible season but a future Super Bowl will be the only thing to erase that they wasted an opportunity. Because the Chicago Bears finished 5-11 last season and were expected by many to finish in last place again in the NFC North, everything the franchise accomplished this year was supposed to feel like gravy. Everybody was asking for progress from the Bears in 2018 and they got plenty of it, so what more could anyone ask after a 16-15 loss to the defending champion Philadelphia Eagles in an NFC Wild Card game? The long-term vision is to open a window where you get multiple opportunities to win a championship or even to win multiple championships. It's what every organization strives for and tangible progress towards possibly opening one of those windows like the Bears did in 2018 is supposed to be celebrated. __Play to win:__ [Enter our free contest and win great prize packs and even cash! ](https://betchicago.chalkline.com/) However, when you start thinking back to all the teams that thought they'd opened a window only to be cruelly informed otherwise, you start to realize how important short-term decision-making can be. An opportunity to win a title doesn't come around often for most franchises, so you've got to make sacrifices to make sure you did everything you could when you had the chance. Look back to the Jacksonville Jaguars a season ago. They thought they had opened up a window with a defense they assumed was so good that it could withstand Blake Bortles. A year later, the future of that franchise is uncertain again and, while they still have some solid pieces, there's no guarantee they'll get a whiff of the postseason anytime soon. So, while Bears fans should be grateful for the success they got to experience in 2018 after seven postseason-less years, it's also understandable if they're irate at all of the chances they let slip through their fingers. And Sunday evening's loss to the Eagles felt like the summation of an incredible season that could have been an all-time great one if not for a few plays they let get away throughout the season. The Bears won 12 games this season and in their five losses, they either led by at least double-digits early (Packers, Dolphins and Patriots) or were tied/leading late in the fourth quarter (Dolphins again, Giants and Eagles). The only time the Bears lost a game where they didn't have a shot to win the game late was in a 38-31 loss to the Patriots and they gave up two special teams touchdowns in that game. Every week of the season, it could be argued that the Bears were the better football team. Yet, they finish with a 12-5 record and Sunday's loss was as cruel as any. ## Bears do Jekyll and Hyde routine on both sides of ball against Eagles The Bears defense was dominant per usual for about 55 minutes. They controlled the line of scrimmage by refusing to allow the Eagles to run the ball and even though Nick Foles was able to move the ball, they made him pay by forcing him into two interceptions. Unfortunately, for about 45 minutes the offense didn't give them much help. Still, trailing 10-6 late in the third quarter, Mitchell Trubisky put together back-to-back scoring drives and gave Chicago a 15-10 lead with 9:04 remaining after a 22-yard touchdown to Allen Robinson. <a href="https://twitter.com/FanDuel/status/1082068392926945280" class="embedly-card" data-card-width="100%" data-card-controls="0">Embedded content: https://twitter.com/FanDuel/status/1082068392926945280</a> Trubisky made sensational throws to keep the Bears alive on that drive. In particular, a third-down bullet into a tight window as Taylor Gabriel ran a deep dig to keep that drive alive made you wonder how that throw could come from the same player who threw so many head-scratching passes in the first three quarters. However, the Bears defense struggled to get the stop that could have sealed the game as Foles led the Eagles on a 12-play, 60-yard scoring drive that ate 3:52 off the clock and gave Philadelphia the 16-15 lead. Still, after a solid kick return from Tarik Cohen (a rare special teams bright spot), the Bears were able to generate another chance late. Trubisky uncorked a brilliant throw down the sideline to Robinson with less than a minute left to get the Bears into field-goal range and give them a chance to win the game. But we'll circle back to that in a moment. ## Bears special teams was always bound to let them down in big way In an ideal world, the nightmarish special teams against the Patriots would have been the catalyst for that unit to get its act together but that simply never happened. Every single week, you could find hidden yardage (and sometimes points) that the unit cost their teams and it usually had nothing to do with whether or not a guy made a play. It was poor decision-making like whether or not to take a ball out of the end zone or somebody taking a bad penalty. Tarik Cohen's ability to create a few big plays as a punt returner was their only real saving grace throughout the season, as the Bears ranked in the bottom third of the league according to Football Outsiders in every other metric. Of course, we usually only see the big mistakes and the Bears had plenty of those too. We were able to laugh off Cody Parkey hitting the upright four times in a win over the Lions earlier this season, but Chicago sports talk radio was full of people correctly predicting that it was foreshadowing something more sinister. Parkey hit the upright again in Week 17 against the Vikings, but a comfortable win belittled its importance again. However, it was impossible not to relive every miss on Sunday. Again more on that later. <a href="https://twitter.com/ForPetesSakeKC/status/1082079781057978368?ref_src=twsrc%5Etfw" class="embedly-card" data-card-width="100%" data-card-controls="0">Embedded content: https://twitter.com/ForPetesSakeKC/status/1082079781057978368?ref_src=twsrc%5Etfw</a> ## What in the world was the deal with Trey Burton and Eddie Jackson? The NBC broadcast on Sunday night did their best to explain what happened to Burton, who was a [surprise scratch](http://www.nfl.com/news/story/0ap3000001008356/article/trey-burton-inactive-eddie-jackson-active-vs-eagles) from the lineup on Sunday. The talented tight end who was a reserve for the Eagles on last year's Super Bowl team woke up with groin pain he hadn't been previously experiencing and tried to work through it but simply couldn't. Burton's loss was enormous for a Bears offense that is at their best when they're using mismatch personnel to isolate either Burton or Cohen against a linebacker in space. However, Jackson not playing after being put on the active roster was an even bigger shock and potentially an even bigger loss. The Bears claimed that Jackson could go if needed going into the half, but they needed a spark throughout the third quarter when they were trailing and the offense was struggling to move the ball. Yet, Jackson was never to be seen. If he was too hurt to play, that's fine, but it makes putting him on the roster an odd decision. One more turnover or a defensive touchdown swings the game in Chicago's favor and Bears fans will constantly wonder what could have been if Jackson had been on the field. ## Cody Parkey Doink Part 6 Despite it all, there the Bears were at the end of the game. There was 0:10 on the clock and Cody Parkey had a good look from 43 yards on a relatively windless, 38-degree night in Chicago. The Bears should have made more plays to put themselves in a position where they won running away, but they still made enough plays to set up what is supposed to be a high-percentage field goal to win the game. But it happened again. 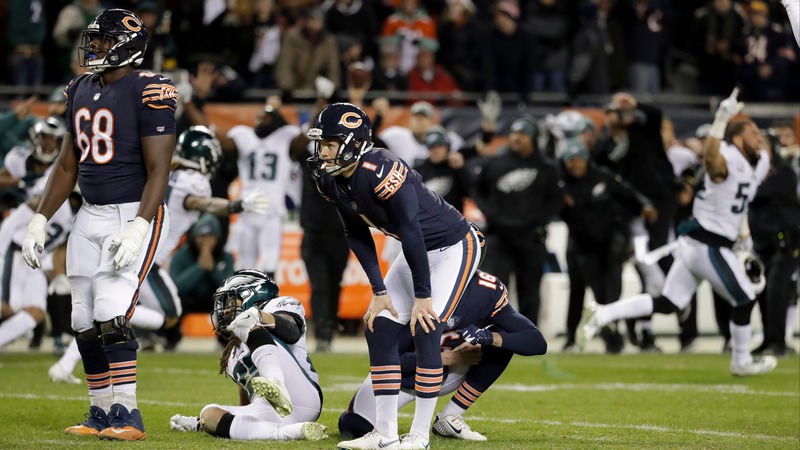 In the sort of fashion that makes it feel like Chicago owes its karma bookies big-time, Parkey's kick struck the left upright and then even managed to hit the crossbar on the way down before ricocheting back into the field of play. If it were a cartoon, it would have been a big white glove slapping 62,462 people on both sides of their faces. Doink... doink. Now, it's hard not to think about every little flap of the butterfly's wings that could have changed things for the better for the Bears. They could have avoided the defending champions by laying down against the Vikings. One more win earns them a first-round bye where they aren't playing tonight and Jackson/Burton are a week healthier. They were a little bit of replay weirdness away from possibly scoring a touchdown instead of a field goal at the end of the first half. Matt Nagy could have gone another direction (jet sweep wide needing two yards is questionable) on the two-point conversion to make it 17-10, thus forcing a tie after the Eagles score instead of needing the field goal. So many little things could have changed the outcome of the game and we know that the Bears defense can give them a chance to win any game, so you have no idea where they go from here in the parallel universe where the kick goes in or something else goes Chicago's way so that they win the game. ## What now for the Chicago Bears? Obviously, this roster isn't perfect. But it is young and it's talented and you just improved by seven wins in a single offseason. Trubisky was much better in Year Two than he was in Year One and that's encouraging even as you justifiably worry about whether or not he's truly the answer. The Bears also have cap space to improve his offensive line and give him another playmaker or two. After what they saw this season, free agents should want to play here too. However, it's also okay if you're not ready to forgive the Bears' transgressions this season. In a sport where less is guaranteed (the health, the money, etc.) than in any other sport, this might have been their one chance and they might have blown it. The only way to get past that will be to win an eventual championship. It's the only cure-all. They took steps in the right direction this season, but complacency would be their worst enemy. After a season where you can point at every game and say a few more plays and we win the game, the easiest way to make a few more plays is with a few more players.